Hey there, again!! So much for sporadic, huh? Tee hee! I remembered that I actually had a card to create for StopAndScrap.com today, and since I played with some challenges for it...I figured I would get it posted right away! I just posted a new card last night as well, so be sure to scroll down and check that one out if you haven't already. Right now there is a lot on sale at StopAndScrap.com, considering Summer CHA is right around the corner. Definitely have to make room for all of the new product! 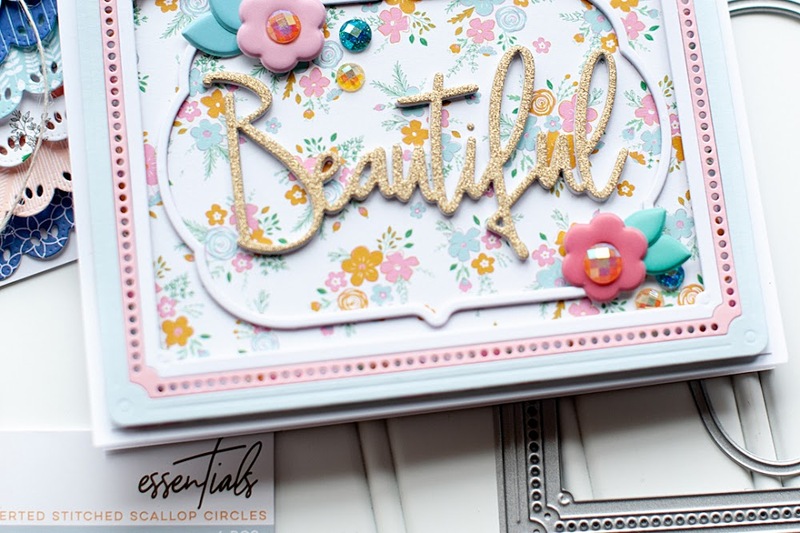 So, I checked out what was remaining of the Glitz Design product, pulled it out of my stash with some Prima flowers....and went to town!! Here is what I created! 2. Cut paper layer slightly smaller, then adhere to the front. 3. Distress ink a doily, then adhere to the right side of the card. Tuck the overlapping part behind the card. 4. Wrap ribbon and crocheted trim around the bottom, and add a matching bow to the left side. 5. Adhere two epoxy stickers to striped paper, cut a banner edge on each one, and adhere underneath the bow. 6. Accent the bow & epoxy stickers with two jewels. 7. Punch an apron lace border to striped paper, then distress ink. 8. Fold the striped paper into an accordion flower, then adhere a rolled fabric flower to the top of it. 9. Adhere the layered flower with two paper flowers to the top of the card to finish. There is a ton of stuff on sale at StopAndScrap.com right now, so go check it out and see what you can't live without! Be sure to check out all the latest pre-orders as well, so you can add a bit of new as well!! I hope you have an awesome Thursday! Hey there, everyone!! Man alive- I apologize for dropping off the face of the planet in terms of my blog! There is nothing crazy going on, other than I am crazy busy right now! Lots of weddings, one of which was my best friend's this past weekend. I was the Matron of Honor AND the photographer.... so you see what has been taking up my time!! Tee hee! I have a few weeks off from weddings (other than editing), but I have also have a bunch of stuff to get done for CHA. So- I might still be posting pretty sporadically for a bit. 2. Cut floral paper slightly smaller, sand the edges and adhere. 3. Cut the top of a small floral paper block with pinking shears, sand the edges and adhere to the top. 4. 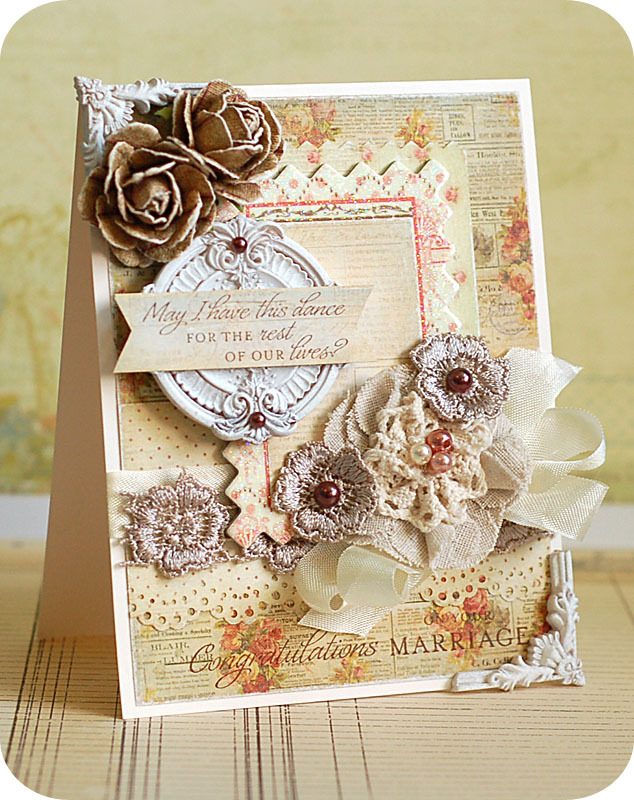 Punch a lace border to a dotted paper strip, sand the edges and adhere to the middle. 5. 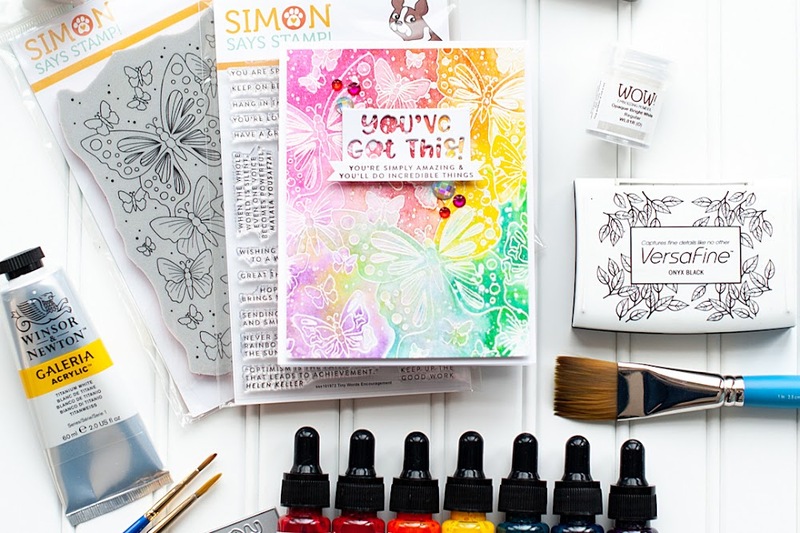 Stamp the bottom sentiment directly to the patterned paper. 6. Wrap seam binding and floral trim directly above the punched border. 7. Adhere the chipboard to the middle of the card. 8. Accent the lower right corner with a seam binding bow, and three fabric flowers. 9. Adhere two paper flowers to the upper left corner. 10. Adhere the resin accents to the card front. 11. 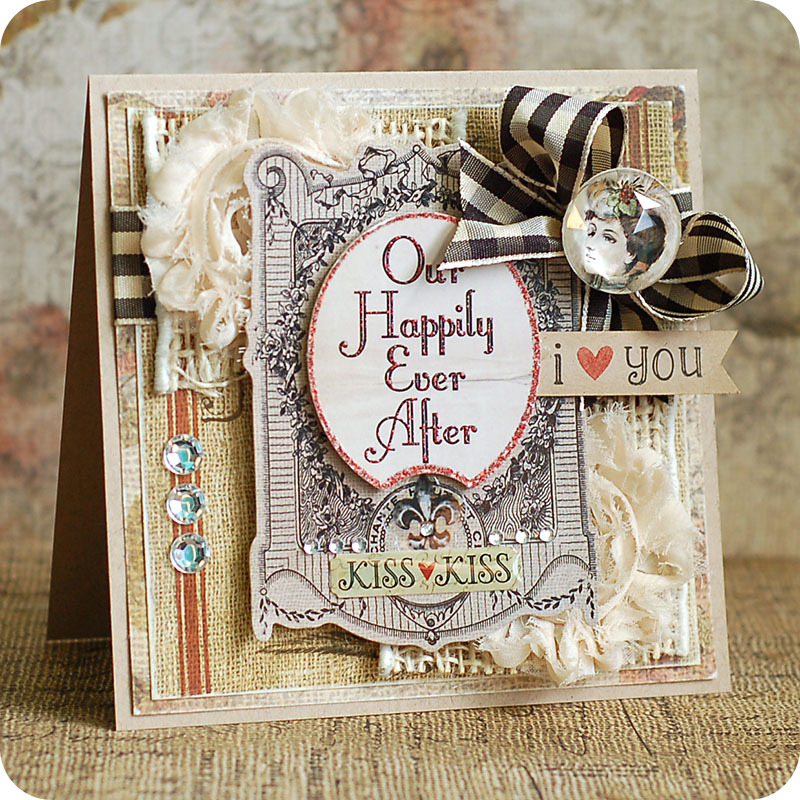 Cut banner edges to a patterned paper strip, stamp the sentiment to it and then adhere to the circle resin accent. 12. Accent the resin and two small fabric flowers with pearls to finish. 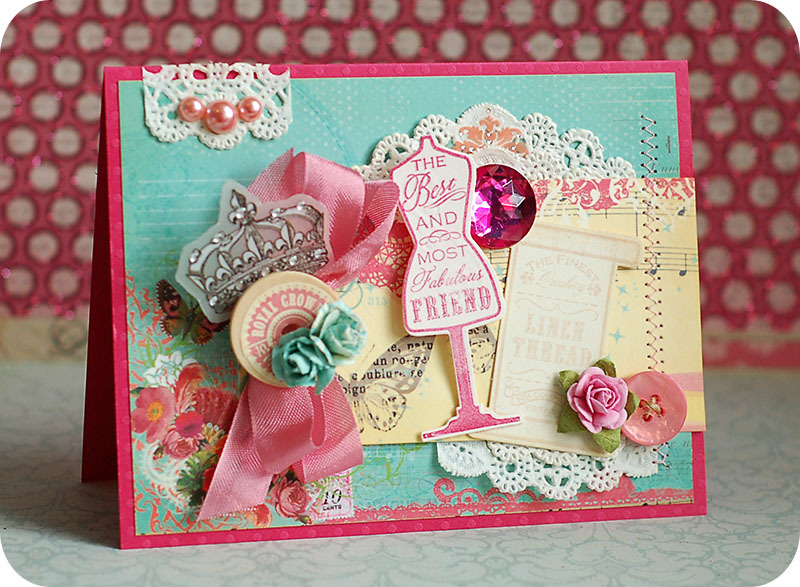 I really love this card that I created, and I am so excited to be part of the Prima design team!! It is one of those "dream jobs" for me...so I am still quite giddy over it all! I hope that you enjoyed my card tonight, and hopefully I will be back soon! ....and I just can't hide it!!!! I can't even explain how elated I am about this...Prima Marketing is one of my favorite companies. I don't often post about making teams and publications, etc...but I had to with this one. I feel so blessed right now. Thanks so much, Prima! I look forward to the next year of working with you! 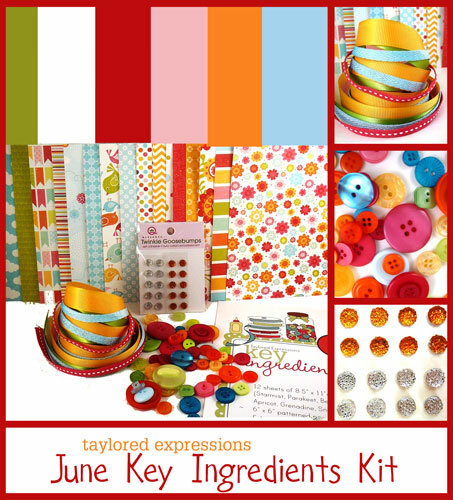 As you can see, Taylor has created a matching stamp set once again for this month's Key Ingredients kit called "Delightful Day"! 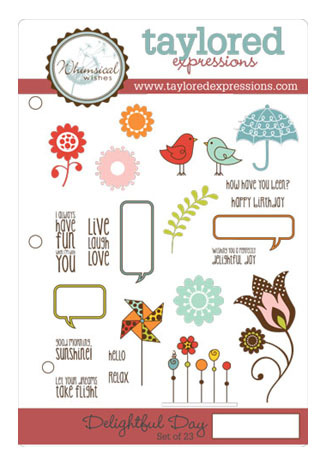 The Delightful Day Stamp Set will be available to KI Subscribers ONLY. It will be available throughout 2012, but it will be at 50% OFF only through 7/10/12. On 7/11/12 the price will return to regular retail of $23.95. So, if you have been kicking around the idea of becoming a Key Ingredients Subscriber, then this is the month to finally take the plunge!! 1. 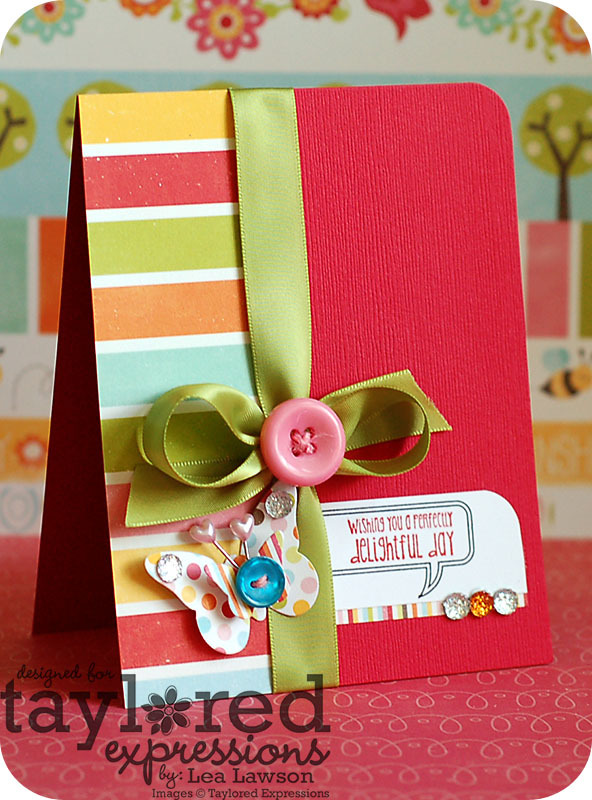 Make A2 card from red cardstock; round upper right corner. 2. Cut a 2" striped paper strip and adhere to the left side. 3. Tie ribbon around the seam, then accent the bow with a twine threaded button. 4. Diecut two butterflies from patterned paper. 5. Adhere to the bottom of the card, along with two heart topped pins for antennas, a twine threaded button in the center, and jewels to the wings. 6. Stamp the sentiment to a strip of white cardstock, round the upper right corner and adhere to the right of the butterfly. 7. Add a thin strip of striped paper to the bottom, then accent with jewels to finish. Don't forget that this is a blog hop, and make sure you check out what the Baker's Dozen & the Key Ingredients team has created for you today! Hey there everyone!! Welcome to the last day of the Lawn Fawn partnership with May Arts!! May Arts generously sent us a lovely assortment of ribbon & trims to use in combination with our Lawn Fawn stamps this week. They sent some of my VERY favorite black/cream checked ribbon, which you will see that I used on my card, along with some wired burlap ribbon, and fabric flowers that I cut from the sheer ribbon they typically reside on. 1. Make 5" square card from kraft cardstock. 2. Cut floral paper slightly smaller; distress ink & sand the edges. 3. Distress the square burlap diecut edges; then adhere to the floral paper. 4. Tie ribbon around the top of the block; then adhere to the card front. 5. 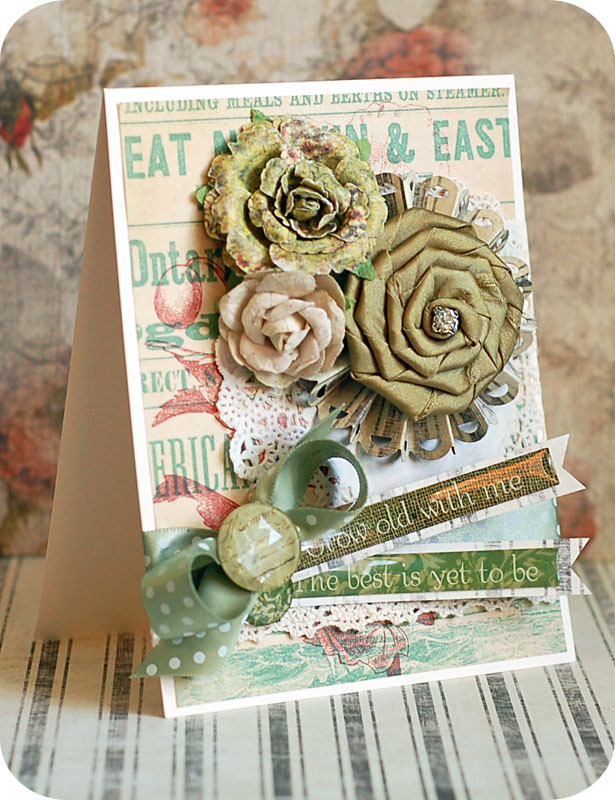 Cut two pieces of burlap ribbon & two fabric flowers; then layer to the card front. 6. Add the dimensional sticker to the front, then accent with jewels & an epoxy sticker. 7. Stamp the "i heart you" sentiment to a kraft cardstock strip, notch the right edge and adhere. 8. Accent the bow with a large jewels, and the lower left corner with three clear jewels to finish. Today I have a sweet little pink & aqua card to share with you, using Pink Paislee papers & tag, and a bunch of bits and baubles here and there. A lot of this product, and many others are now part of the Daily Deals section at StopAndScrap.com. Lots of great deals in there, so you will definitely want to check it out! 1. 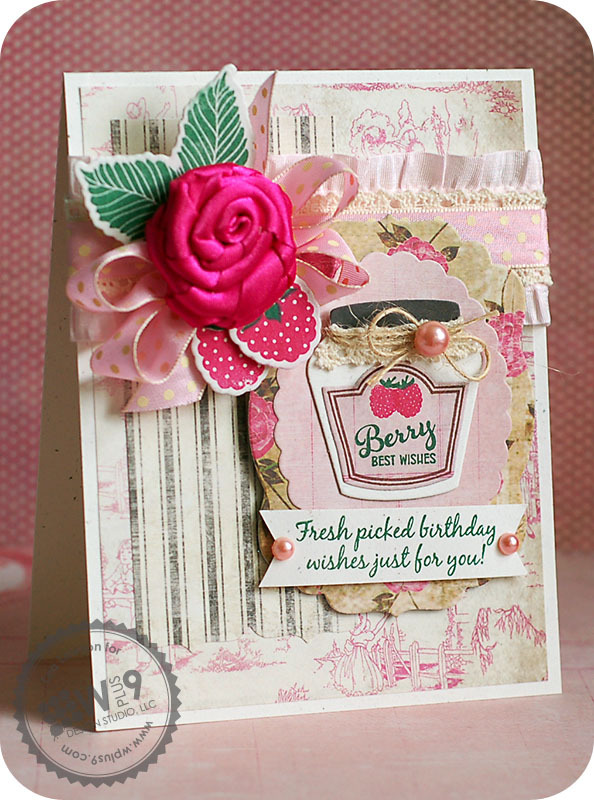 Make A2 card from pink cardstock. 2. Cut aqua paper slightly smaller and adhere. 3. Distress ink and cut up one doily; adhere in layers to the card front, adding a pink sticker inbetween the top doilies. 4. Adhere a printed tag over top of the doilies, then zig-zag stitch along the right side. 5. Tie a double bow from pink seam binding; then adhere with a wooden button, crown sticker & aqua paper flowers to tag. 6. Diecut the dressform & thread bobbin from vintage cream cardstock and distress ink; then stamp the images to them and adhere to the tag. 7. Adhere a large pink jewel to the top of the tag, tucking it slightly under the stamped dressform. 8. Thread a pink button with twine, then adhere with a pink flower to the right of the stamped bobbin. 9. Add three pink pearls to the doily cut in the left corner to finish. Hey there, everyone!! So- did you love the big WPlus9 reveal yesterday? If you missed it, check it out on Dawn's Reveal Blog Post. Tonight's group post means two things...the stamps and dies will be available for purchase at the WPlus9 Online Shop!! And, it means we get to see what each designer does again with her release product. This is my FAVE part of the week, because I love to see what each designer chooses to use, and with what. 2. Cut pink toile paper slightly smaller and adhere. 3. Punch a border to a striped paper strip and adhere to the left. 4. Wrap pink ribbon, crochet trim and dotted ribbon around the top. 5. Tie a double bow from matching dotted ribbon; adhere to the left side and top with a rolled fabric flower. 6. Diecut the labels, layer together and adhere to the right. 7. Diecut the preserves jar, stamp the sentiment label and layer together. Top with crochet trim, twine and a pearl. Adhere to the top of the label layers. 8. Stamp the bottom sentiment to an oatmeal cardstock strip, notch the edges and adhere. Add pearls to each side. 9. Diecut the leaves & raspberries, stamp the images to them and adhere to the top and bottom of the bow to finish. Be sure to check out what the rest of the WPlus9 designers have come up with for tonight's group post! 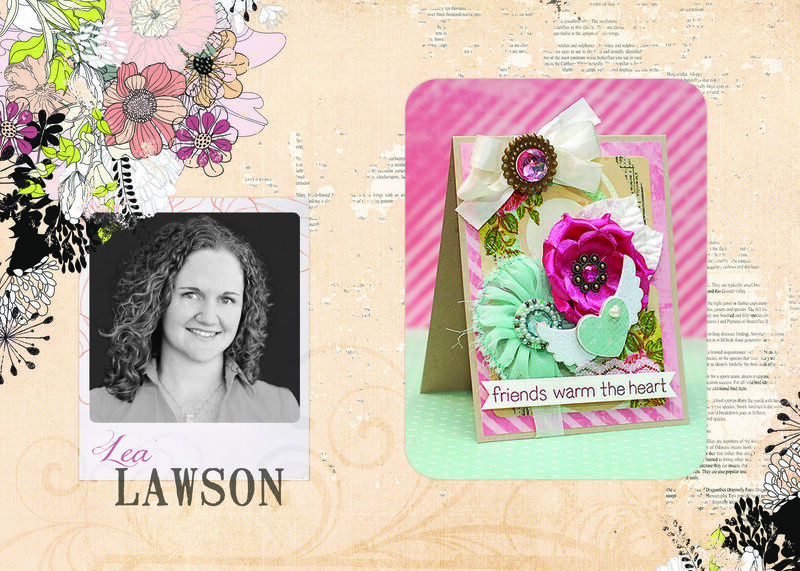 Cherry Nelson- our fab guest designer!! I went super clean and simple for my card, and left the focus on the fun sentiment & fish images. I did use a woodgrain stamp from a different company, as I couldn't find a piece of patterned paper that fit my vision for the card. I think it turned out really fun...here is what I created! 1. Make A2 card from kraft cardstock; round the bottom corners. 2. 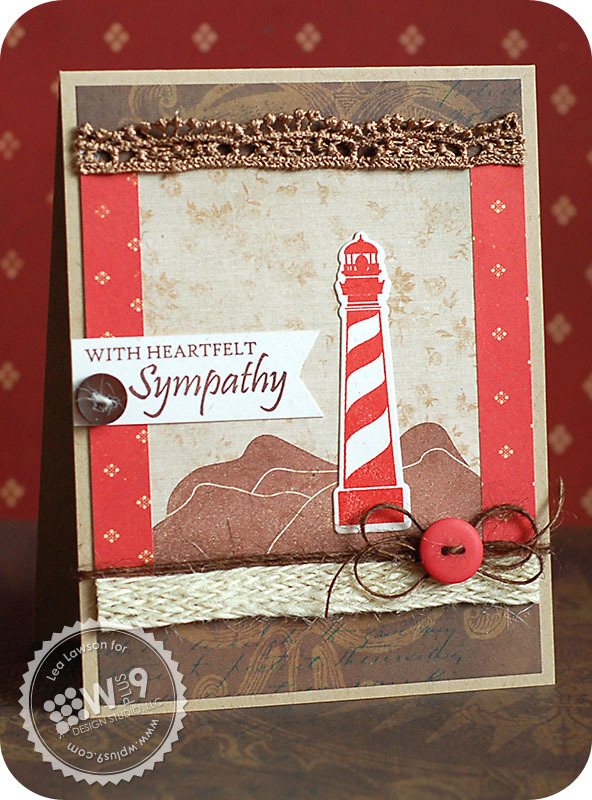 Stamp the woodgrain background to the card front. 3. Diecut the fish & banner from oatmeal cardstock; stamp the image and sentiment to them. 4. 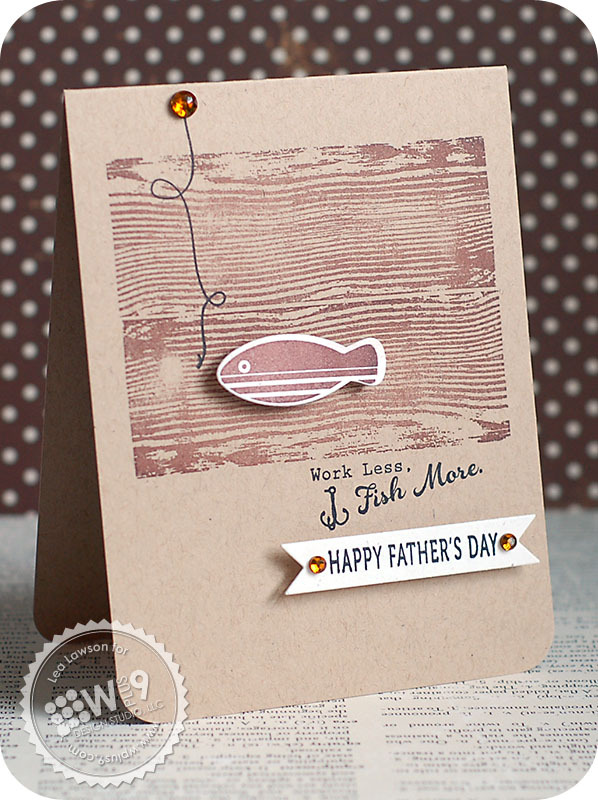 Stamp the fishing line, sentiment & hook directly to the card front. 5. Adhere the diecut fish and banner to the front using foam adhesive. 6. Accent with brown jewels to finish. Because my card is sympathy based, I chose to use a mostly muted color palette, except for the pops of red. The red seemed fitting due to the nautical theme, and provided a little bit of elegance as well. Here is what I came up with! 2. Cut brown paper slightly smaller, then adhere. 3. Stamp the rocks to a tan paper block, then adhere. 4. Add two strips of red paper to each side of the tan paper block. 5. Diecut the lighthouse from oatmeal cardstock, stamp the image to it and adhere. 6. Adhere brown lace to the top seam, and burlap trim to the bottom seam. 7. Tie brown twine around the bottom seam, and top with a twine threaded button. 8. Stamp the sentiment to an oatmeal cardstock strip, notch the end and adhere. 9. Add a twine threaded button to the sentiment tag to finish. 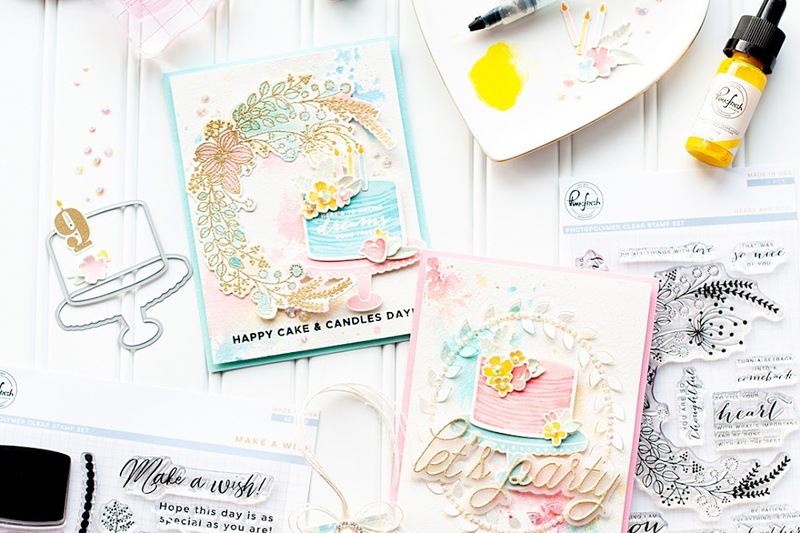 Don't forget to check out what the rest of the WPlus9 crew has created today, and of course....Dawn always does a giveaway on her blog!! Hey there, everyone! Welcome to day 2 of the June WPlus9 release week!! So, what did you think of "Fresh Picked" from yesterday? Isn't it fabulous?!! I am seriously LOVING these sets. Do you want to know why? Because they can be used together, which makes for even more stamping possibilities!!! I love it!! I went with a shaped card this time around, because it just seemed fitting. I have a couple different fabrics in there to give it some texture, just like the homey goodness that a jar of homemade jam brings. Here is what I created! 1. Using a Cricut Expression & Wild Cards cartridge, cut at 5 1/4" from oatmeal cardstock. 2. Cut a 4 inch circle from striped paper; distress the edges. 3. Distress the edges of a flower paper strip; adhere to the circle. 4. Trim the excess floral paper from the circle; finish distressing the edges. 5. Wrap tulle around the left side of the floral paper; top with a tulle bow, jewel & heart stickpins. 6. Cut a notched end to a strip of burlap, then adhere across the middle. 7. Diecut the label, tag & jar from oatmeal & kraft cardstock; distress ink the edges, then stamp the images and sentiment to them. 8. 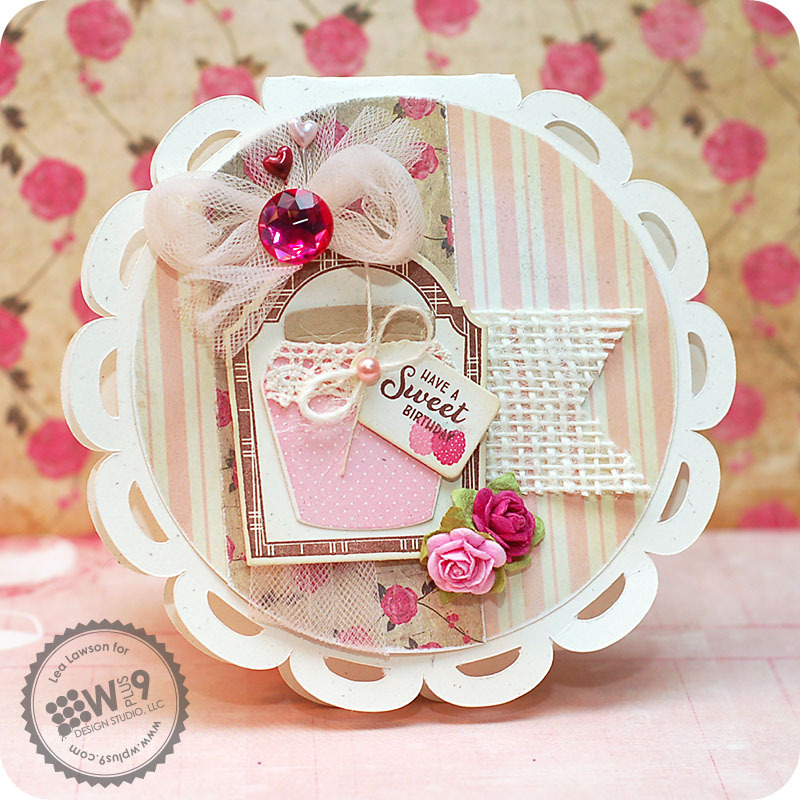 Layer together to the card front, along with crocheted trim, a twine bow and a pink pearl. 9. Add two paper flowers to the lower corner to finish.